Having always been an entrepreneur as a kid, Spencer X. Smith then went on to found and sell an IT services company in 2006, before he went into corporate sales. His job meant he was prohibited from using social media at a time when it was just starting to take off. He could see how it was becoming a useful business development tool and how his inability to use it was a big impediment. In January 2015, he eventually went head-long into social media once he’d given up his security licenses. Now, he experiments to figure the tactics which work, and then shares them so everyone else can benefit from his shortcuts to gain more clients by building a personal brand. Social media represents a technological development in which it has never been so easy to scale a message to lots of people. What once used to take him hours can now be done far more effectively in just a matter of minutes. Spencer has had huge success with social media in just a matter of a few years, and he shares with us exactly how he achieved that. Spencer’s job used to involve him taking a five and a half hour drive every Monday morning to get to work, and then on a Friday evening to go home. During his Monday morning drives which would start shortly after 2 am, he wasted the time needlessly learning new languages and listening to audio books. Then he thought of a more productive way of spending that time. With a list of people he wanted to reconnect with, he’d ring up those people and leave a voice message on their work phones, knowing they’d listen to it as soon as they’d get in the office. During that time, he’d manage to call around 150 people, leaving them all the same voice mail, and it would mean they’d be reminded of him. With social media, he can do the same thing, but instead, reach thousands of people with just a few minutes of effort. It used to be so hard to meet new potential clients and to get in front of people because we didn’t have our own broadcast mechanism. You’d either have to pay someone else to be able to talk to their audience, or you’d just hustle. Between 2008 and 2015, Spencer reckons he’d clocked up over 3,000 in-person sales meetings, on top of attending as many networking events as possible. In 2014, there were 43 people across America at the company he worked for, doing the same job. They were all brought into a sales meeting, asking for eight of them to be a part of an advisory board to help figure out social media. What the company wanted to do was produce one piece of content, and have all 43 people push it out from their own accounts. But Spencer saw where they were going wrong with this plan. So he went off by himself with the outlook of helping smaller business figure out how to be more nimble with their social media to out-manoeuvre large organizations in their business development. Before that, he’d just had the obligatory Facebook and Twitter accounts where he was listening. That actually ended up working in his favor as it meant he didn’t have to overcome a bias for keeping his business and personal output separate. When you’re on your LinkedIn profile, you’re in business mode, and therefore ready to consume business data. That’s where he started to look for conversations framed around business. After all, if your boss is going to catch you using social media, you’d want it to be LinkedIn. Instead of goofing off, it looks like you’re working. And that’s exactly the same for everyone else on LinkedIn as well. So that’s where he first concentrated his efforts, and only more recently moved to Twitter and Facebook too. With LinkedIn, his posts can get thousands of views or even a five-figure readership. So that means he is getting out in front of a lot more people than just the 150 he was once achieving. When people don’t know what to say on social media, the default is to talk about themselves. But it is actually a good opportunity to highlight other people and their accomplishments, especially on LinkedIn. Not only is it easy to rationalize to yourself, but those people you’re talking about will share it with their audience. When he did this, he saw his connections and followers increase dramatically, because he became the purveyor of good news. And when you do it, you have to tag the person in the post. Otherwise, how will they know you’re doing that? It’s the same for Facebook and Instagram. And that’s how Spencer got a feature in Forbes, by simply sharing the stuff of one of their writers on Twitter, and tagging her in the posts each time. She would thank him for doing it, and a few months later, she reached out to him and asked to write about him. Help A Reporter Out (HARO) is a place where a writer can ask for resources for articles which they are writing. And if they’re using a service like that, then they probably don’t have a stable list of sources which they can rely on. So the people he finds on there become a part of Spencer’s hit list. Not only does he answer their queries, it also gives him an idea of who is out there, being active, and in need of help. And that’s where he found out about the Forbes writer. Now, he answers at least one request on HARO every morning. And it has led to him being quoted over 60 times. If you ever want to achieve a goal, the best thing is to declare it publically. You then have people who will hold you accountable. And that’s what he did when he told a room full of people he was speaking to that he was going to get into Forbes. The goal then isn’t just about your accomplishment, but as you show how you’ve done it, you pave the way for others to do it and benefit too. By giving that away, it puts positive pressure on you to carry it on. Even before the internet, there have always been conferences and other events where people get together and share best practices. It’s because they need to hear from their peers as well, so they give something back in return. With social media, these walls have been broken, and there is no need to travel in order to participate in these conversations. There isn’t a lack of information out there now, but it is the follow up where the opportunity lies. The more you give away, the more beneficial you are to people in comparison to the competition. And referrals are a great way of generation business. So while the person reading your blog post may not end up using your product or service because you’ve helped them, they are likely to recommend the expert who helped them, to other people. So don’t worry about repeating topics that have already been covered again and again, as only you can say it in the way you’d say it. People will benefit from hearing it from you. Don’t assume people already know things, and even if they already knew it, you can be the reminder they need to crack on. 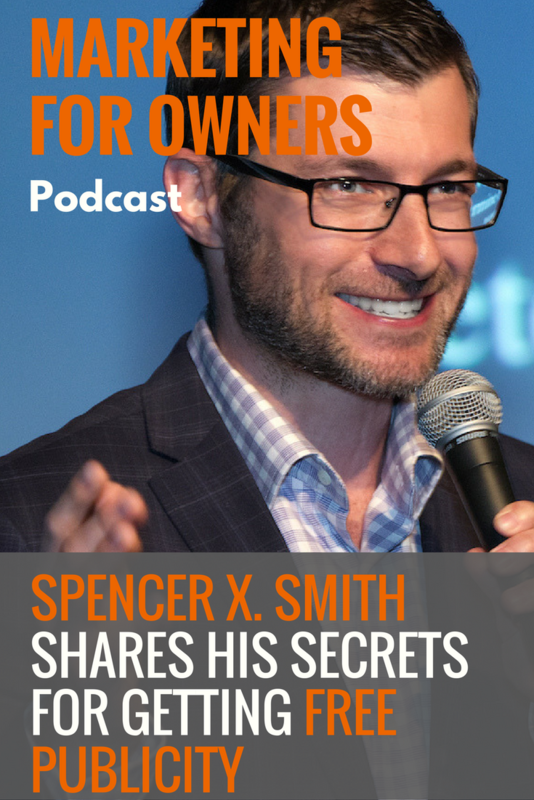 Find out more about Spencer X. Smith on his website, where you can also pick up a step-by-step guide to gain free publicity in major media outlets. His one-page cheat sheet tells you how to use HARO and then what to say when you find the perfect opportunity to help someone out.